A rally has been held at the National Railway Museum in York over its possible closure. The protest followed a recent warning by its owners, the Science Museum Group (SMG), about further budgetary cuts. It said either the National Railway Museum, the National Media Museum in Bradford or the Museum of Science and Industry in Manchester could close. James Alexander, leader of City of York Council, said: "We need to be vocal and show cross-party support." The SMG, which also owns the Science Museum in London, has said a further 10% reduction in government funding would leave it "little choice" but to close one of its northern museums. Mr Alexander, a Labour councillor, said: "We can't be in the situation where we are just the north of England, we are ignored by the government because we are not in London." He said he hoped the event would highlight the strength of public feeling in support of keeping the museum open. Hugh Bayley, York Central's Labour MP, also spoke at the meeting. 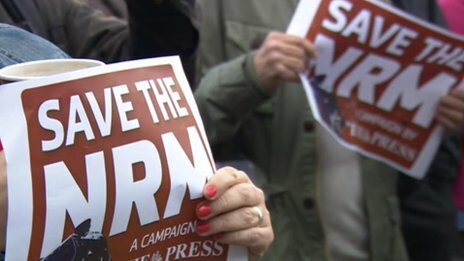 The rally took place ahead of a planned debate in Parliament about the future of the museums. Dr John Sentamu, the Archbishop of York, said on Thursday he was "shocked" by warnings that one of three museums in the north of England would close if funding was cut any further. York Council's Labour, Conservative, Lib Dem and Green group leaders have already written a letter to Maria Miller, culture secretary, about the impact of any reduction in government funding for the SMG. The letter said the National Railway Museum played a "critical part" in attracting tourists, who contribute £443m annually, to the city.